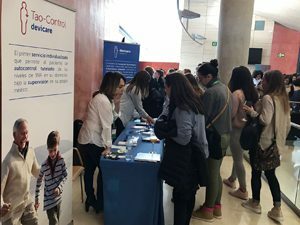 At the National Congress of the nurses’ union SATSE Catalunya, held on 29 and 30 March in Barcelona (Spain), and which more than 600 nurses and physiotherapists attended, two challenges were proposed for improving the current medical care model: empowering the patient and greater use of new technologies (digital health), in other words, moving towards Nursing 2.0. Among the various innovations that were presented, Devicare Tao-control® was well received. Tao-control® is the first service that enables patients taking oral anticoagulants (anti-vitamin K such as Sintrom® or Aldocumar®) to self-manage INR levels from their own home (always under their doctor’s supervision). In Spain alone, there are 800,000 patients who require this type of care. Other experiences were also shared, such as that of Anna Sort, a nurse and expert in gamification to improve the patient’s health, and that of Adrián Sarria, coordinator of the Nursing College of Valencia, who explained the different possibilities that mobile applications bring to the profession. The Congress was inaugurated by the Director of Health Services of Barcelona City Hall, Davide Malmusi; the President of SATSE, Victor Aznar; the Secretary of SATSE Catalunya, Montse Peña, and the Director of the Foundation for the Development of Nursing (FUDEN), Amelia Amezcua.